Grant Family Farms lies in the foothills of the Colorado Rocky Mountains, just south of the Wyoming border. We are deeply committed to growing healthy, delicious food and to being responsible stewards of our land and the people that work on our farm. 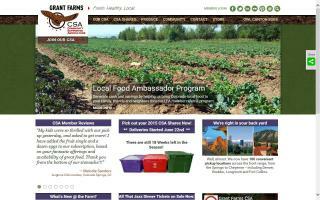 Our Community Supported Agriculture program has members throughout Colorado and Wyoming. Our convenient community pick up locations are managed by volunteers - al of which are deeply dedicated to advancing the local foods movement. When you join our CSA - you automatically become part of something larger than yourself and help push local foods forward.